one is southbound onto Arroyo Seco Parkway, other is northbound as indicated above). 80: Arroyo Seco Freeway going under Hollywood Freeway at '4-level interchange structure', where it becomes Harbor Freeway. Ramp shown is off Hollywood Freeway, northbound onto Arroyo Seco Parkway. 81: Looking north on Arroyo Seco Freeway where it passes under Hollywood Freeway. Taken from Arroyo Seco southbound lane. Arroyo Seco joins Harbor Freeway without a break under the '4-level interchange structure' where all the freeways converge. Ramp nearest is inbound from Santa Ana--Ramona Freeways to take southbound traffic onto Harbor Freeway. Other ramp takes Hollywood Freeway onto Arroyo Seco Parkway to go northbound. 8: Lanes, left to right or top to bottom, on Arroyo Seco Parkway at Sunset Blvd. bridge: 1: Converging under bridge are Hollywood Freeway and Santa Ana--Ramona Frewways northbound ramps onto Arroyo Seco Parkway. 2: Northbound lane, Arroyo Seco Parkway. 3: Southbound lane, Arroyo Seco Parkway which joins onto Harbor Freeway under the '4-level interchange structure' downtown. 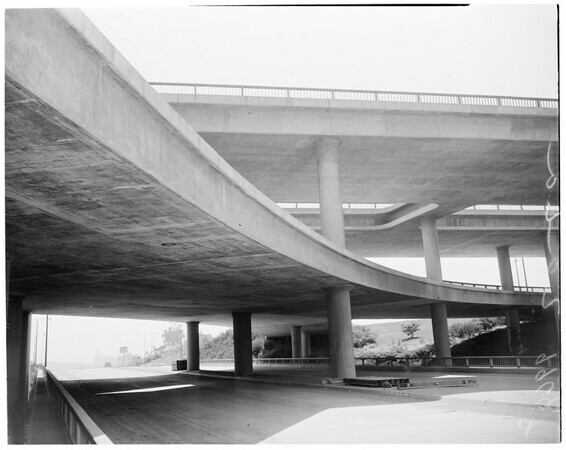 4: Ramp to Santa Ana Freeway, eastbound, off Arroyo Seco Parkway."